Here’s a timeline of the major events I’ve found in his service and his life from that point. 1837 By July 1837 he was appointed Midshipman. Prior to the establishment of the US Naval Academy in October 1845, Midshipmen were largely trained at sea, on the job – initially by their commanding officers and chaplains, later by dedicated mathematics and other instructors. So I expect young Taylor spent most of the next 5 years at sea, learning his trade as a naval officer and taking on leadership roles of increasing responsibility. 1842 He sat for and passed the exams, and was warranted Passed Midshipman, the next rung on the command ladder, on 1 July. 1843 He was assigned as Acting Master – a ship’s navigation and sailing expert – to the USS On-ka-hy-e (possibly from the Oneida, “dancing feather”), a converted sailing yacht which saw service patrolling in the Caribbean for pirates and slavers. Later in 1843 he was sent in that role to the sloop of war USS Vandalia, 18 guns. 1847 He was aboard Vandalia to June 1847, when he came ashore from sea duty. 1848 He then served in USS Brandywine, a 44-gun frigate, again as acting Master. 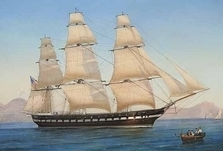 Brandywine was flagship of the US Navy’s Brazil Squadron, and she cruised the South Atlantic through 1850. 1849 On 23 June 1849 he was warranted as Master, and soon after commissioned at that rank, 4th of 11 officers “in line for promotion”. 1850 He was assigned to the sloop USS John Adams, then off the coast of Africa, but my not have immediately reported aboard. He had returned ashore, was examined by a board of officers, and was commissioned Lieutenant, USN on 5 February 1850. In that era it was a significant commission, and not easily obtained. He had then been in service about 13 years but was not quite 30 years old. While ashore, on 3 June, he married Virginia Williamson, also from Norfolk. Her brother-in-law Dr. Robert Baylor Tunstall stood for her (her father had died in 1847). She had Naval officers in her family, so presumably she knew what the life was like. John was probably married in his new Lieutenant’s uniform. 1851 He was at sea again, possibly aboard John Adams, but came ashore in November. He was then assigned to the US Coast Survey (now the US National Geodetic Survey) and stationed at Norfolk into 1852. 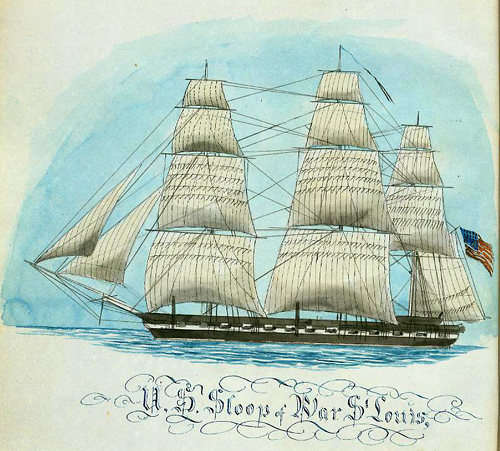 1855 St. Louis returned home, putting into New York City on 8 May. Lt. Taylor was probably aboard to September 1855, when he left sea duty for the last time. After almost 20 years of service, at age 35, he was furloughed and transferred to the Reserved List, probably at his own request. Although I don’t know why, for sure, an impending family event may have been a factor. 1856 On 23 May 1856 daughter Elizabeth Tunstall “Bettie” Taylor was born to John and Virginia in Norfolk. 1860 In the US Census John, clerk, wife Virginia, and daughter Bettie were counted in Norfolk. 1861 The Virginia Convention voted to secede from the United States in April 1861, and shortly afterward John S. Taylor resigned his US Navy commission and offered his service to his State. As a former US Navy officer who expressed interest, he was automatically offered a commission in the Virginia service. By June 1861 he was a Lieutenant in the Confederate States Navy (CSN), and assigned duty in charge of coastal defenses at Lambert’s Point, Norfolk, with a battery of 6 32-pounder guns. In October he was commissioned Captain of Artillery, Provisional Army of the Confederate States (PACS). …I should have mentioned that two guns of Jordan’s battery, under Lieutenant Bower, were sent to an advance position [map] under Capt. John S. Taylor, but had to retire, owing to their exposed position and the fire of several batteries against them … Capt. John S. Taylor, Confederate States Artillery, temporarily attached to my staff, was killed in the morning while gallantly discharging his duties. He was entirely fearless, and always sought the post of danger, and his example did much toward inspiring his daring in all around him. Taylor, John L. From Norfolk, Virginia. Connected with the CSN in some way. vadc to S. D. Lee’s Bn. Arty., from about Sept. 1, 1862. mwia at Sharpsburg—shot in the neck. Obviously that was not satisfactory. Colonel Lee’s Report gave me a jumping-off point, and the Navy Register, a source I have not used much before, was tremendously helpful. Not just for details about Taylor, but as a more general education about the US Navy officer corps in the 19th Century. If you have interest in that direction, I recommend these volumes highly. The Hathi Trust has assembled digital copies of these online for the years 1825, 1848-50, and 1852-1970. It having been repeatedly represented to the Department that confusion arises from the use of the “Larboard” and “Starboard”, in consequence of their similarity of sound, the word “Port” is hereafter to be substituted for “Larboard”. Captain Taylor has a page, of course, on Antietam on the Web. The battle quotes above are from Colonel S.D. Lee’s Report for Sharpsburg, from The War of the Rebellion: a Compilation of the Official Records of the Union and Confederate Armies (OR), Series 1, Vol 19, Part 1 (Antietam – Serial 27) , Pages 844-847. 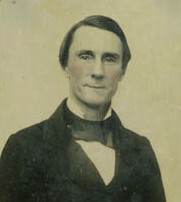 Taylor’s photographs are from an ambrotype and a daguerrotype, respectively, in the collection of the Virginia Historical Society, Richmond. 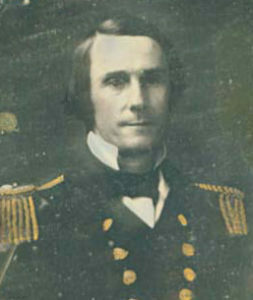 His naval record is in the Register of the Commissioned and Warrant Officers of the United States Navy and Marine Corps, from the volumes for the years 1848 – 1860. Details from announcements in the Army and Navy Chronicle and United Service Journal in 1837, 1843, 1852, and 1855. Confederate service in the Naval Defenses of Virginia, an attachment to Governor John Letcher’s Message from the Executive of 16 June 1861, Porter’s A Record of Events in Norfolk County, Virginia, from April 19th, 1861, to May 10th, 1862 (1892), and the OR (1880-1901). 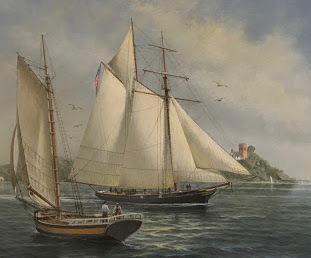 The painting of USS On-ka-hy-e is by Charles Lundgren (1979), and is owned by Kent B. and Audrey Carol Lewis, of Small Boat Restoration. The oil of The U.S. Frigate Brandywine/44 Guns/in Naples Bay 1832 (1832) is by Tommaso de Simone, and was offered by the Neal Auction Company. His marriage date from Virginia Marriage Records for 1850. Family backgrounds from genealogists online and the Daughters of the American Revolution. The watercolor sketch of USS St Louis by Moses A. Lane is among a collection of Lane’s papers [catalog entry] in the Princeton University Library, which also holds his journal from that 1852-1855 voyage.